My mom passed away August 27, 2016. When I came back to work at Hallmark, we were working on an activity for Hispanic heritage month: creating a display of Day of the Dead altars. HEART (the Hispanic Education Awareness Resource Team at Hallmark) suggested I make one for my mother. I thought it might be too soon—I wasn’t sure if I could do it, emotionally. But I decided it would be good therapy. First, though, I needed to research how to make a Day of the Dead altar. 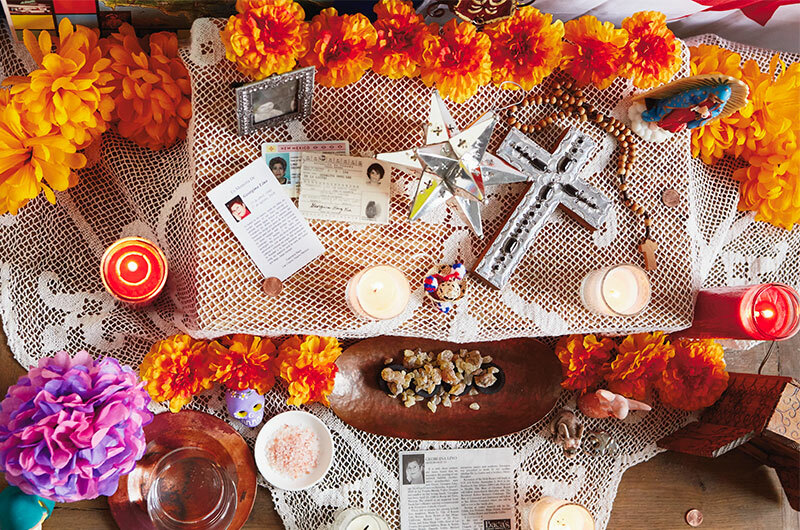 What is a Day of the Dead altar? In parts of Mexico—and more and more, in the United States—people celebrate Día de los Muertos, Day of the Dead, on November 1 and 2. The first day you honor children, and the second is for remembering adults who have passed. 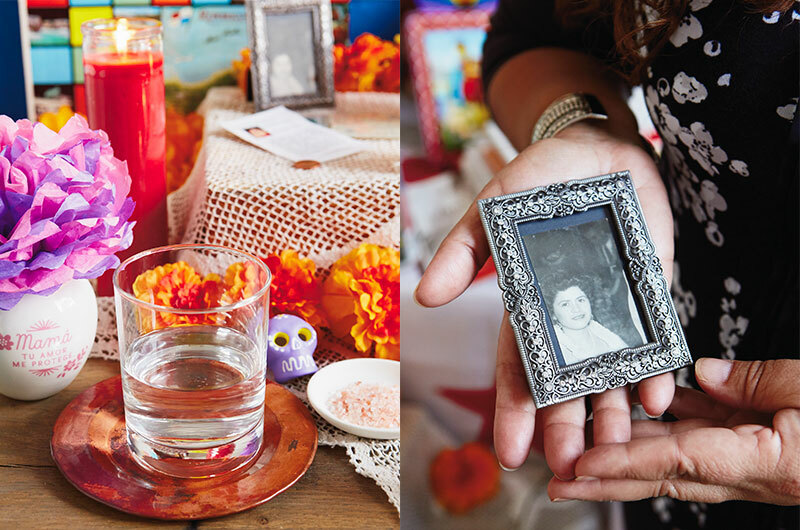 Families create altars to display ofrendas, or offerings, to welcome the spirits of loved ones into their homes. Check out our overview of Day of the Dead here. 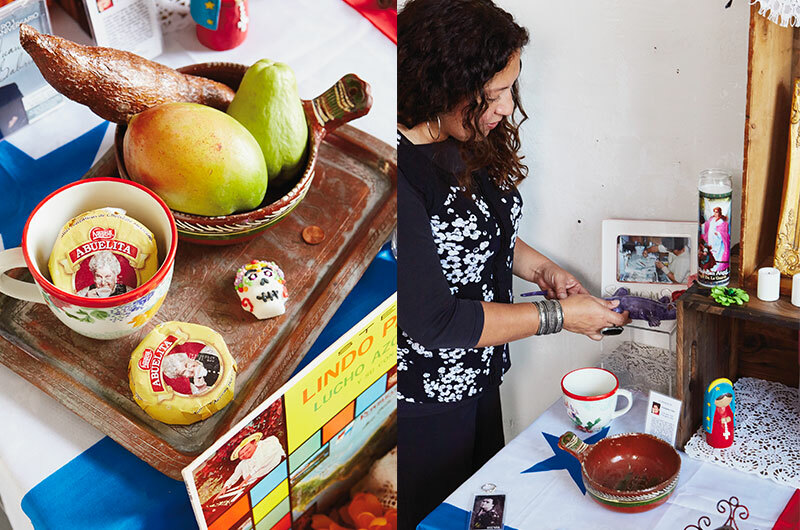 Mom was Panamanian and Dad is Mexican-American, but we didn’t really do altars growing up. In Panama, there was a procession, and then you’d go to church. Because it’s part of my culture, I wanted to make an altar and to learn as much as I could about how to choose ofrendas. 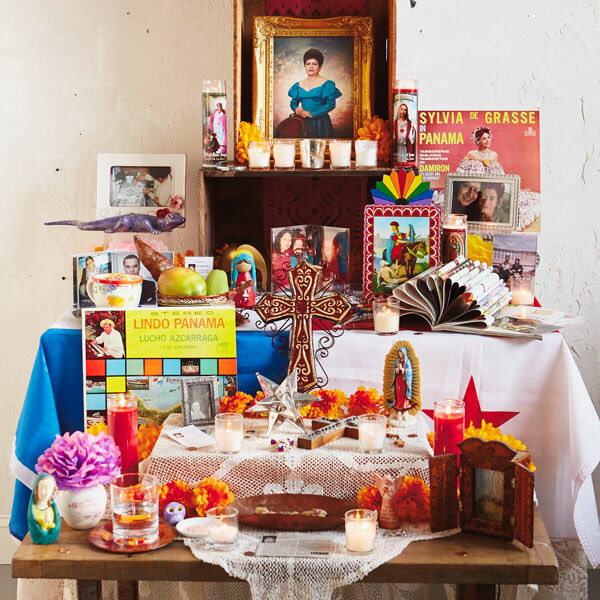 Altars are built in multiple levels on tables and include a mix of personal items and traditional components. The altar can commemorate one person or many people and honor people you know or celebrities you love. 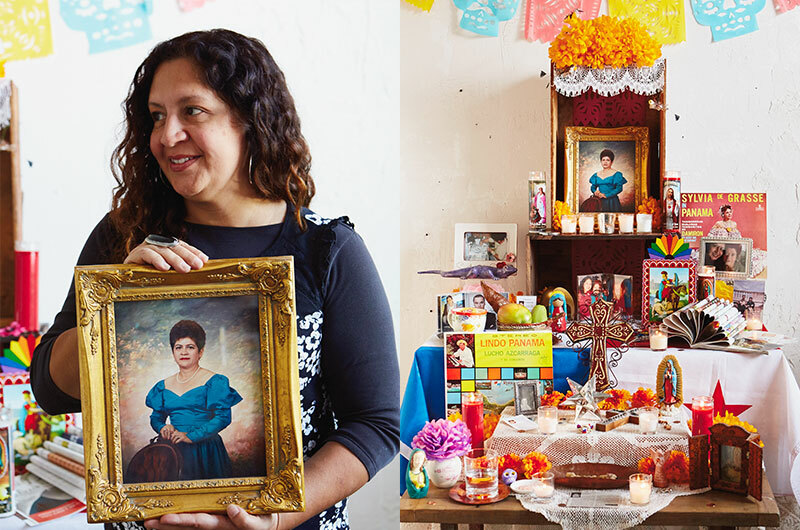 One friend, for example, covers her huge dining room table with little altars for members of her family and friends. She invited me to add one for my mom with a photo and a candle. As we went through Mom’s house, I started to pull things together. I gathered things she loved, photographs, and objects with stories behind them. Altars have different levels to symbolize the journey between heaven and earth. Because Mom was Catholic, mine had three, representing heaven, purgatory, and earth. Some altars have a lower level to represent the underworld, and others include steps to heaven. Calaveras are the best known Day of the Dead symbols. The candy sugar skulls are decorated with frosting and sometimes personalized with names. A dish of salt is a purifying element. A cup of water and favorite foods refresh the souls when they return. Many include pan de muertos, a sweet bread. Water is also included as one of the four elements. Orange marigolds, cempasúchil, represent earth. Papel picado, decorative cut tissue paper, are hung in banners to represent wind. Candles, part of the Catholic tradition, represent fire. The smell of incense—usually copal—is said to draw souls to the house. I love the smell. Gathering meaningful items and remembering stories are part of what makes this so healing. Everything I added to my mom’s altar meant something. Because Mom was from Panama, I found fruit grown there: yucca, chayotes, mangoes. Every Christmas I go home, and one of our traditions is to go to midnight mass. My mom would always make us Mexican hot chocolate—the Abuelita brand. I included the little Mexican chocolate tablets and a mug to symbolize the hot chocolate she would make after mass. A cross is there to represent our Catholic faith, and I added a little ceramic angel a coworker gave me after Mom died. Choosing a photo is one of the most important things. I selected a smaller version of the one we displayed next to the casket at her funeral. I added a photo of her with my dad and me as an infant. Mom loved making ceramics for people. She’d always ask, “If I could make you a ceramic, what would it be?” I have pictures of her making a purple lizard for me, so I included those and the lizard. She loved word searches. Her first language is Spanish, so sometimes she would be doing word searches and ask, “What does this mean?” She would always look for the words and was eager to learn. When we were cleaning out her house, we would find pennies. We found them in every room where you would least expect them. We didn’t know whether scattering pennies was a superstition or for good luck because she never told us. We gathered them, and when I was making the altar, I knew I had to scatter those pennies all over. Mom loved to cook and had a huge crush on Guy Fieri. So I added a Food Network magazine folded to look like a fan. She was happiest when she put on traditional Panamanian music, so I displayed some of her albums. I also included a few of the elephants and hummingbirds Mom enjoyed collecting. Building the altar took about half a day, and there were lots of emotional moments. But I was very happy with the way my Diá de los Muertos altar turned out. I don’t believe you have to be Catholic or Hispanic to want to honor someone you love in this way. It’s a beautiful tradition to try.